I'd like to begin my post with a necessary quote from Mean Girls. The amount of bullying and hatred that goes on within the nail polish community is actually unbelievable. I decided to participate in today's No H8 Mani Challenge because I believe everyone needs to quit the drama, and get along! Of course, the message we are spreading today goes well beyond the nail polish community. I don't wanna get all preachy cause that ain't how I do it here but the bottom line is, we've all been bullied and we have all been bullies ourselves. And it's not cool. So let's band together and pledge to stop being mean girls. I went way back into my photo archive to find a manicure-from-the-past to put in today's post to stand up against people who critisize others based on their nails or their skills or their photos or whatnot. And boy I found a good one, from about two and a half years ago. We have all been there, people. Don't be a bully if someone isn't perfect. None of us are perfect. I chose Deborah Lippmann - Let's Go Crazy for my purple mani, one of my favorite polishes. That's all for today, folks. I love you all! I'm loving how lots of you are posting old mani's. I think it really helps out and gives all of us inspiration! One of my favorite things to do is to look at old photos from my favorite bloggers. It helps when I'm feeling down or not happy with my own photos or design to remind me that we all start somewhere and none of us are perfect. It encourages me to know that if I keep doing what I love and working at it I can get better at it just like they did. I'm still struggling with taking good photos since I can't afford a real camera right now (I use my iPhone for all of my pics). But I just keep plugging along because I don't want the the joy nail polish and blogging brings me to hinge of what I use to take my pics with. Thanks for such a great post! Lovely polish and mani, thxxx for the support! Let's Go Crazy looks gorgeous! Great cause and great polish Rebecca! Its nice to see you post your old mani too, really good way to get the message across and spread the love. I'm loving every second of this. I'm sporting purple today, too! Ahhh, didn't see all this until almost too late to change my polish! Getting my Purple on soon.... Love this and thanks Rebecca! Thanks for sharing your older mani. It gives us all hope knowing we can and will get better if we try! Thank you, this is a great message right now for everyone. Is it a weekly thinng? 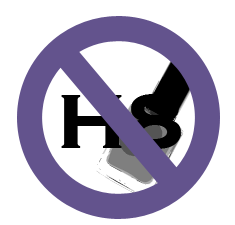 No H8 day? Purple !